The Solution below shows the 3 most common D-sharp major imperfect authentic cadences on the piano and treble clef. This step shows the root position IAC in the key of D-sharp major. In contrast to the D# major perfect authentic cadence the tonic of chord I does not need to be the highest note of this chord, and so the cadence is weaker. So in this major key, we are going from the D# major triad chord #V - A# major chord, to D# major triad chord #I - D# major chord. To demonstrate this, on the treble clef above, D# major triad chord #I, D# major triad chord #V, and D# major triad chord #IV are used to set up the phrase as being in this key, then the cadence chords V and I finish off the phrase, giving only a partial sense of completion, in comparison to the perfect authentic variation. This step shows the inverted IAC in the key of D-sharp major. For example, in this major key, we are going from the 1st inversion of D# major triad chord #V - A# major chord, to D# major triad chord #I - D# major chord. In contrast to the D# major perfect authentic cadence, which has chord V in root position, in this example, this cadence has chord V inverted, but is the same in all other respects. 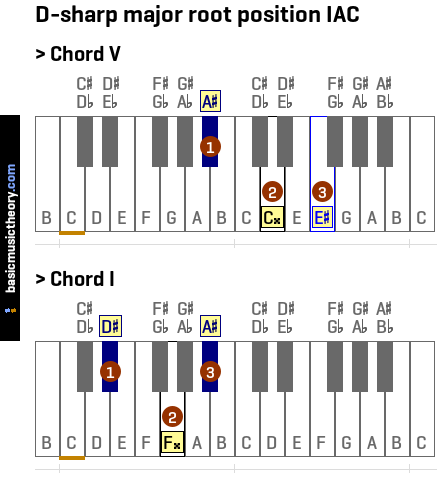 To demonstrate this, on the treble clef above, D# major triad chord #I, D# major triad chord #V, and D# major triad chord #IV are used to set up the phrase as being in this key, then the cadence chords V6 (Chord V in 1st inversion) and chord I finish off the phrase, giving a weaker sense of completion and resolution compared to the perfect authentic cadence. This step shows the leading tone IAC in the key of D-sharp major. So in this major key, we are going from the D# major triad chord #viio - C## diminished chord, to D# major triad chord #I - D# major chord. To demonstrate this, on the treble clef above, chords D# major triad chord #I, D# major triad chord #V, and D# major triad chord #IV are used to set up the phrase as being in this key, then the cadence chords viio and I finish off the phrase. Before describing the details of the imperfect authentic cadence in the key of D-sharp major, first it would be to useful to identify the scale notes, degrees and chords that could be used in this key. This step shows the D-sharp major root position IAC on the piano and treble clef. So looking up the chords relating to these scale degrees from the table above, we are going from the D# major triad chord #V - A# major chord, to D# major triad chord #I - D# major chord. For an example in this key, whereas the perfect authentic cadence added the tonic of the octave note D# onto chord I, creating a chord with 4 notes, the imperfect variation will just use the tonic triad chord as it is, unchanged, with the usual 3 notes. In this case, the highest note is A#, which is not the triad root, so the cadence is considered imperfect. It is less strong than the perfect version, because it doesn't give the same sense of closure or completion to the phrase. To do this, we are using chords D# major triad chord #I, D# major triad chord #V, and D# major triad chord #IV, and after hearing these chords, followed by the first chord in the cadence (V again), our ear is definitely expecting the tonic chord as the final chord in the sequence. This step shows the D-sharp major inverted IAC on the piano and treble clef. We will use the D# major perfect authentic cadence in the same key as a starting point, then invert the first chord (chord V) of the cadence, and leave the final chord (I + 8th / octave note) unchanged. To invert chord V, we will move its root - note A#, up one octave, so it has moved from the lowest to the highest note pitch of the chord. By moving the root up, we have created chord V in 1st inversion. Note C## is now the bass note of the chord. To do this, we are using chords D# major triad chord #I, D# major triad chord #V, and D# major triad chord #IV, and after hearing these chords, our ear might expect to hear chord V again, followed by the tonic chord. Instead, we get chord V in 1st inversion followed by the tonic chord. The inversion of chord V (V6) gives an unexpected twist on the way back to the tonic chord (in comparison to the D# major perfect authentic cadence), so the the cadence feels less predictable and strong as a result. This step shows the D-sharp major leading tone IAC on the piano and treble clef. 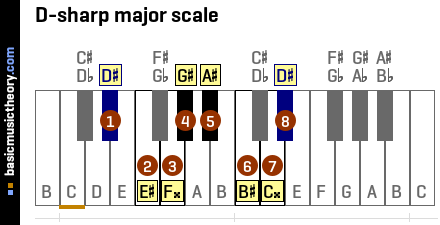 In comparison to the D# major perfect authentic cadence, and the imperfect cadences shown above, which all move from chord D# major triad chord #V, this leading tone cadence substitutes chord V for D# major triad chord #viio. 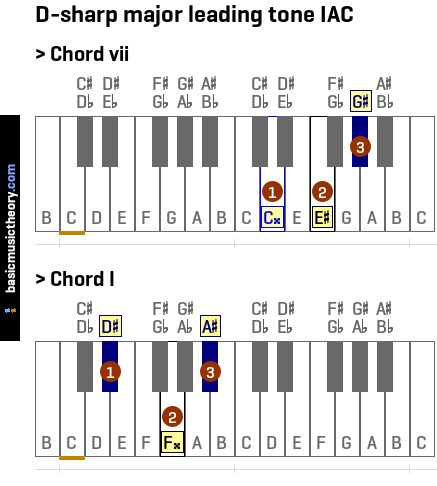 This chord contains the leading tone / note - of the D# major scale - note C## as the chord root. So looking up the chords relating to these scale degrees from the table above, we are going from the D# major triad chord #viio - C## diminished chord, to D# major triad chord #I - D# major chord. To do this, we are using chords D# major triad chord #I, D# major triad chord #V, and D# major triad chord #IV, and after hearing these chords, our ear is might be expecting chord V then chord I as the final chord in the sequence (as per the D# major perfect authentic cadence). Although this cadence does give quite a strong resolution and sense of completion, , it is a weaker cadence than the D# major perfect authentic cadence, since the relationship between dominant(V) and tonic(I) is the strongest possible tonal relationship in diatonic scales.